23 September, 2014: the culmination of four years as leader. Milliband’s last major pitch to lead the country, for this parliament at least. From now, time can only tell whether it has been the gateway to a whole new vista of politics for Miliband and the keys to No. 10; an attempt to convince his party that he would be still the best option after a narrow defeat; or some kind of a swansong. Now, the central message of the speech is one which resonates – with the Tories, you’re on your own. The many not the few. We all believe in that, it’s what makes us Labour. And Miliband rightly points up the transparent makeover that David Cameron made of his party, in order to get elected, only to be swiftly ditched shortly thereafter. Good attack lines. The question is, of course, with eight months to a general election, whether we are perceived as offering a credible, viable alternative. But we are getting ahead of ourselves. Presentationally, the decision to offer a ten-year plan, while admirably long-term thinking, seems a tactical error (at least we might thank our lucky stars it was not a five-year plan, although the echo of Chairman Mao was still enough to please the headline-writers). But these are quibbles. It is the meat we need to evaluate. To start with, it was telling that the centerpiece of the speech is a conversation with a former Lib Dem voter. Worryingly, whether or not we believe in the existence of the fabled “35% strategy” of attracting former Lib Dem voters, we certainly still seem to be aiming for the Lib-Dems-plus-a-few-other-odds-and-sods strategy, a patchwork quilt of support from different interest groups. And we can see it in the speech – there is a nod to practically everyone. While some of this is normal in a conference speech, here it veered towards the extreme: the gay vote, pro-Europe liberals, public service workers, boxes were being ticked for parcels of leftish voters in every other sentence. To ensure we don’t lose either Muslim or Jewish voters, dammit, the man is even going to bring peace between Israel and Palestine. All the while, there is one fundamental truth about Britain’s electoral makeup which, after all this time, we are still apparently having trouble grasping: that Labour only gets to govern when they attract votes from the centre; those who would otherwise vote Tory. But woolly thinking abounds. For instance, “equal rights for the self-employed”: as Michael Crick tweeted, what exactly does it mean? It seems we have not grasped the fact that many are self-employed because they choose to be; they accept the deal of trading greater job security for being paid a little better. We cannot just march in and tell them they are victims who need more rights. Another example: the speech’s only serious foray into foreign policy was on ISIL but here it was stymied by a lack of grasp of the subject. A UN Security Council resolution must be demanded, to support military action against ISIL. Trouble is, Miliband might as well ask for the resolution to be written on parchment and brought to the UN on the back of a unicorn; Russia, as everyone knows, will veto. Meanwhile, the same day, Cameron is at the UN, playing the statesman. On to the speech’s core, where we have the now-traditional pre-election pledge points (six – you get an extra one free with this leadership). Ensuring “the wages of everyday working people grow at the same rate” as the economy is economically illiterate unless you mean an incomes policy. Yes, that’s right: what Labour espoused in the 1970s. That is what the leadership’s totemic idea of “pre-distribution” ultimately reduces to. “Ensuring as many school-leavers go on apprenticeships as university” is at least quantifiable; but it is also doubtful in terms of having Britain compete with a China and India whose graduate populations are growing at an alarming rate. Home-building makes sense. Tackling low wages: ok. But “Create one million more high-tech jobs by securing the UK’s position as is a world leader in green industries”: how, exactly? And as for “build a world-class, 21st century health and care service”, it sounds merely vaguely hopeful. 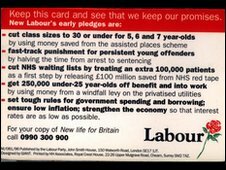 In short, these are not the solid pledges of 1997, but someone’s wish list. This is not good. And finally, to the issue of the day. It still seems incredible but, last week, we came the closest we have to the breakup of Britain since Ireland seceded in 1923. To his credit, Miliband makes an important point: “all of us in this hall have a responsibility to try and explain why 45 per cent of people voted yes”. Indeed we do. The trouble is that there is a more uncomfortable and truer answer than his own, that its habitants “don’t think we can solve their problems”; that much is obvious. And it’s that Scots were sick of Labour. Oh, it’s true they were sick of the Tories as well; they always are, as Cameron himself would surely recognise. But we were different. Labour has ruled Scottish politics for as long as anyone can remember, and was then given nearly two decades of untrammeled power. During much of that time we fielded, harsh though it may sound, our B-team. We and we alone created the conditions for a populist like Salmond to flourish, and then only narrowly saved Scotland from destroying itself and the Union in the resulting protest vote. That is the reality. Just as we did with Lutfur Rahman in Tower Hamlets, our hegemony created an unhealthy politics, and the result was the creation of monsters outside our party: spectres leading protest votes against us, which voters are only now finally starting to see through. Furthermore, Labour still needs an answer to the referendum’s aftermath. Cameron is offering the political bulldozer of English Votes for English Laws; an effective way of hobbling the Labour Party either in Parliament or outside it, by stopping Scots from voting on English issues. While it is respectable to avoid being a turkey voting for Christmas in going along with Cameron’s plan, it may not be enough to simply accuse Cameron of playing politics (though he clearly is). And our response, a Constitutional Convention, seems at once both wonkish and woefully inadequate. But there are bigger responses still we lack. In the end, probably the most important question overall is this: have we done something this conference, as Kevin Meagher said yesterday at Uncut, to “address the issue around leadership and economic credibility”? We shall see, but one strongly suspects the polling will continue in similarly tragic vein in October, November and thereafter on these twin albatrosses. While in recent months there seems to have been a little harder-nosed thinking and a late realisation that some of the leadership’s wilder flights of soft-left fancy will not gel with the electorate, we still seem to have ended up with a hotch-potch of policies. Policies which hope to tick enough boxes in a rainbow coalition but as a whole – according to a wide range of speech reactions – ultimately please neither left nor right. And people who stay in the middle of the road, as Nye Bevan once put it, tend to get run over. The last speech. With a slender and ever-eroding poll lead, we needed, simply, a speech which would change the weather. This one didn’t. The election, if it was not before, is now officially in the lap of the gods. This entry was posted on Wednesday, September 24th, 2014 at 12:53 pm	and is filed under Uncut. You can follow any responses to this entry through the RSS 2.0 feed.You can skip to the end and leave a response. Pinging is currently not allowed. As an ex Labour voter, I’m considering which way to vote at the next GE. I thought that some good may come out of this conference, but sadly not. Labour and Miliband in particular seems to comes out of this badly with even the left wing press ridiculing his speech and the absence of any real substance. Andrew Neil is ripping the great and good of Labour to pieces as they fumble over policy spending commitments. The party managers must be held responsible for this debacle which has all the organisation and co-ordination of a 4 year olds birthday party. In a few weeks time Cameron will stand up and tell England that he believes in England and will delivery on his promise of keep Scots MP’s out of English affairs. This will resonate with the soft UKIP supporters who will return to the Conservative fold. Labour will continue to bleat “its not fair” and try to rubbish it and Cameron will point out that Labour has deserted the English working class in the quest for self preservation and self interest. Labour has had decades of rule in Scotland and done nothing except cultivate nationalist feelings of anger towards Westminster and the union. Miliband was and is an enormous mistake, and one which will I think prove costly at the next GE and his patronising waffle unravels under media scrutiny. Why isn’t the Labour leadership defending its party against the elitist, sexist, arrogant policies of our current govt, which not many people even admit to voting for!? The prosperity of city finance is deeply reliant on the social stability of UK; elitist polices restrict social mobility & limit our human resources; the fairly successful fight 4 women’s rights during past century gives us access to twice as much knowledge & work skills than many other places in the world; our tolerance of differing creed & cultural opinions puts us leaps ahead of more bigoted states. WHY AREN’T THE LABOUR PARTY PEOPLE POINTING THIS OUT? Well, the best of luck, comrades. Your leader wasn’t talking to me, of course – I’m not one of the 35%; I’m a middle-aged white man who doesn’t work for the government or the media and already pays quite enough tax, thanks very much for asking. I was 16 when I left school (my own fault, had a genius for lousing up fantastic opportunities) and got my education and qualifications in the Army – another reason Ed wasn’t talking to me, I’m, you know, all old-fashioned and patriotic and rather like being English, despite being a first-generation immigrant. If Labour should by some incredible mischance get in in 2015, you all need to hope you are in coalition with the Lib Dems, they pretty well have to have acquired some subcutaneous competence, if only through osmosis, since 2010; if all you have to offer the nation is Ed Balls at No 11, to work his magic yet again on the deficit and the economy, well…. But I think this is academic. No amount of rhetoric, no amount of tractor production statistics, no amount of pretending that a couple of extra billion will make a huge difference to a health budget which is three times the defence budget, no amount of confiscations of legal and legitimate profit from industries which are already responsible for a huge amount of tax revenue, will make up for the total lack of a clear, believable and achievable vision of precisely how we’d be better off under Labour. In particular, here, I’m thinking of foreign affairs. These are dangerous days and I see no-one on the Labour front bench with even the haziest grasp of either grand strategy or how to go about protecting and promoting the national interest abroad. @ExLabour: yes, I agreed the EVEL thing is a worry, to which we have not yet got any kind of adequate response. @Henrik: I think we agree entirely on Labour’s lack of grasp of foreign affairs, although if I remember correctly we may differ on what the right direction might be. our tolerance of differing creed & cultural opinions puts us leaps ahead of more bigoted states. WHY AREN’T THE LABOUR PARTY PEOPLE POINTING THIS OUT? Ummm two decades?? Labour were in coalition with the Lib Dems from 1999 to 2007 – 8 years. The SNP have been in power since. “With a slender and ever-eroding poll lead” Labour’s poll of poll lead is pretty robust and has increased since late May. You’ve obviously forgotten about the successful Scottish Constitutional Convention that created the blue print for Scottish devolution. What I also forgot was a big move of Labour support to the Yes campaign in Scotland. Another worry for Labour is how this will translate into votes at a GE. I’m betting that there will be some sort of backlash. As for EVEL, this is where UKIP have translated votes. Call it “little Englander” or whatever you want, but it does resonate with a significant proportion of the English population. More so when they see cash and powers being thrown at Scotland. My advice to Labour is to just accept it and work with it. I know this will not happen, but it will be just another stick to beat Miliband and Labour with. You can see the Tory election posters and TV adverts now and a half decent campaign manager at Tory HQ will destroy Labour with some clever negativity. With the likely Scottish Yes backlash and English if they shy away from EVEL, plus the UKIP voters targeting traditional Labour heartlands ( Farage has firmly put his tanks on your lawn in Donny), plus the scandals at Labour councils like Rotherham, it will be very tough for Labour to come through this GE. I think we may disagree slightly on the approach route, but I sense the end state we see as desirable is similar. @StephenHildon: you are quite right about the two decades, it’s an error. The corrected version, “best part of a decade”, didn’t make it through to what I sent to Uncut. However, as I’m sure you’re aware, this doesn’t change the argument one jot. And as for the Constitutional Convention, if you think you can enthuse Britons about it, good luck with that. Some Scots saw it as a way to independence, therefore it flew: the rest of the UK has no such carrot. By the way Stephen, are you still supporting the dire Venezuelan regime under Nicolas Maduro?